The Salomones size is rarely smoked by the modern aficionado. As time has become a valued asset, the big cigars from past glory cigar days become special event smokes only. Finding three hours to enjoy a cigar is a luxury one can only experience during weddings or big dinners. What a pity, because this monster Double Figurado is packed with rich earthy and woody aromas. Draw is always excellent. If stored properly, aging can be limitless. 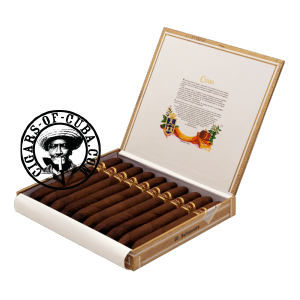 The Salomones by Cuaba are real jewels and smoke perfectly for special occasions. Large and impressive, fantastic construction. Mild start on this Salomones due to the big ring gauge. The aromas start to appear in the second phase. Leather, spice and light woodiness dominate. The finale can be very strong, almost overwhelming. To be smoked on a full stomach. Dense, flavorful smoke! truly enjoyable from beginning to three hours later at the end. Well worth the price of admission.